I made a striped sweater for my daughter and I ended up with a huge amount of leftover yarn. 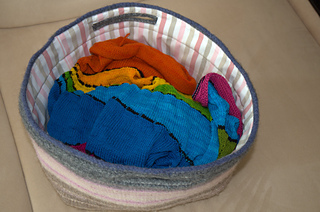 When my friend sent me even more scraps, I knew it was time to use them all and to create something that is fun, useful and helps me to get rid of all the accumulated yarn at the same time. 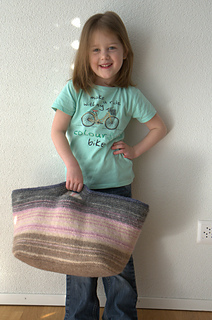 The solution was this big stash-buster project bag. 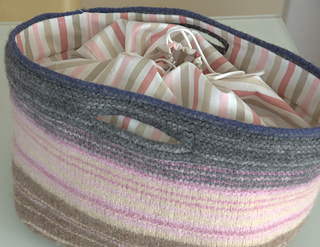 I love it: it has enough space to hold my biggest projects and it’s decorative, therefore you can keep it on the sofa during the long months required to finish those ambitious projects. 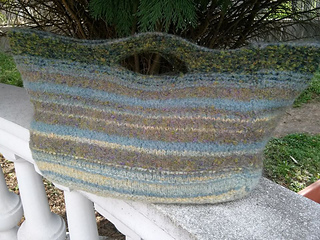 Felting gives strength to the bag to stand on its own, and guarantees subtle color changes too. 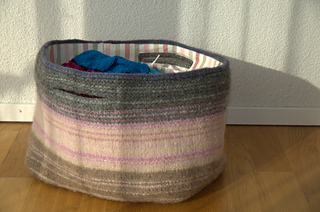 It works with almost every color combination and with different color repeats. 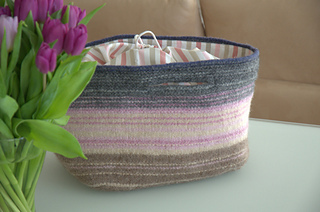 Please feel free to personalize the stripe sections to fit your stash. Pattern contains lining instructions too! Size: Felted size: 22 cm (8¾ inches) deep, 30 cm (11¾ inches) wide and 22 cm (8¾ inches) high. Before felting: 23 cm (9 inches) deep, 31cm (12¼ inches) wide and 29 (11½ inches) high.